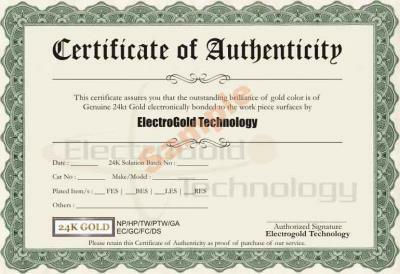 ElectroGold™ provides you: The highest quality, longest lasting, most brilliant Genuine 24K Gold finish available. Guaranteed. Upon delivery, if you are not satisfied with the job for any reason, it’s on us, period. No one in the industry can or will stand behind such a simple claim. We do because customer satisfaction is our number one priority and we are darned PROUD of our work. That’s why before telling you about our service we tell you about our guarantee. We believe that’s what makes good business and good friends and by trying our service, you’ll be sure to get both. 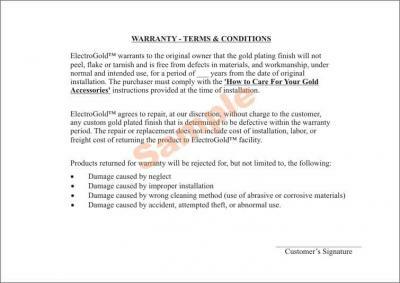 ElectroGold™ : Quality & Satisfaction, it just makes…. Sense.